Use the buttons above to navigate the site. It shouldn't be that difficult. Proud supporter of the blue ribbon campaign to remember SeaQuest DSV, the Blue Ribbon Campaign for Free Speech Online, Not In Our Name anti-war movement, and VoteNoWar.org grassroots democracy and anti-war movement. 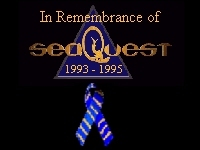 November 12, 2003 was a sad, sad day for SeaQuest fans. Actor Johnathan Brandis, who played the series' boy genius, Lucas Wolenczek, died at Cedars-Sinai Medical Center, after attempting suicide on Nov. 11. Thanks for visiting. Why don't you sign my guestbook? I'd also love you forever if you'd send this site to a friend if you found it cool. This site is ©2001-2002 Erin Klitzke. For the Kartuiin Sector Conflict, click here.